At the end of the last episode (Heaven Sent) the Doctor escaped his confession dial after being trapped in it for several billion years and emerged on Gallifrey. His home planet, saved from the Time War, has apparently not been put in another dimension but shoved to the end of time where the rest of the universe won’t be able to catch up to it. As clumsy as that sounds, I kind of like the concept, even though many fans could probably pick a billion holes in that idea in the blink of an eye. On Gallifrey the cloister bells are ringing all across the capital as the Doctor has returned. In quiet contemplation the Doctor goes to the barn that we saw in the Day of the Doctor anniversary special (as well as Listen last season) where a woman enters and starts to angrily tell him to get out until she recognizes him. Could it be his mother? Or someone who raised him? A nanny type figure perhaps? After the Doctor changes his coat from that dashing red velvet jacket to a black coat more reminiscent of the first Doctor’s wardrobe, the woman brings him some soup, and he’s about to eat, when a group of outsiders (Shobogans perhaps?) surrounded his table, in a very “last supper”-ish feel as a battleship flies up to the table with its weapon targeting the Doctor. The pilot is delivering a message that the President wants the Doctor to go to the capital. Drawing a line in the sand with his boot heel, the Doctor returns to his soup. More soldiers are sent to retrieve the Doctor, the General from Day of the Doctor is sent to retrieve the Doctor, but he will not go. In the capital the leader of the Sisterhood of Karn tells the President that the Doctor doesn’t blame Gallifrey for the Time War, he just blames the president. The President finally goes to the Doctor, with the General and with his soldiers and orders them to shoot him. All the soldiers miss. Insubordination, because the Doctor is an honoured war hero. The Doctor proceeds to tell Rassilon to “get off my planet”, and we see the ex-Lord President banished into space, though he really has nowhere to go. Now we (kind of) learn the whole reason the Time Lords put the Doctor in the confession dial, they’re afraid of the Hybrid and need to know what the Doctor knows about it. The Doctor tells them what he knows, but uses an extraction chamber to pull Clara Oswald out of time at the instant of her death on Earth billions of years ago, because he says she knows what the Hybrid is. Now the race is on as the Doctor hides from the Time Lords in an attempt to break through to the Matrix sub levels and find an old TARDIS (since his own is still on Earth) and rescue Clara. His plan succeeds and somewhat makes sense, he will take them to the end of time to escape and restart Clara’s time stream, saving her life. Only thing is that her heart does not restart, and she is not really “alive” again. At the end of time he finds “Me” or Ashildr with whom he argues about who the Hybrid is. She teases the Doctor that he himself is the Hybrid, he accuses her of being the Hybrid, but Ashildr tells him that the Hybrid is not one person, but two people, the Doctor and Clara being together and being so similar. The Doctor fought through billions of years of torture to get her back, so it’s not really a stretch to think he would destroy everything, to abandon every code he ever lived by, to leave Gallifrey in ashes to save her. Left with only one alternative to keep her safe, the Doctor is set to wipe Clara’s memory of him, but instead, ends up wiping his own memory of her. To him now, she’s only visible by the holes she’s left in his life (and memory). He kind of does the reverse to what he did to Donna in series 4, which is probably for the best. If he had to deal with Clara’s death a second time it would be difficult to forge a relationship between him and whoever the incoming companion is, not only for the character but for the audience too. A lot of people really didn’t like Martha just because she came in after Rose. As I’ve said before Clara became a very divisive character to the fans. Hopefully now everyone can move on, those who love Clara can go forward imagining that she’s still “alive” and probably having adventures, those who don’t love her can imagine that she’s returned to the trap street and her destiny. Great acting, and a great story that had me until the very end, but I think the ending left me a little disappointed because it didn’t offer much resolution to Clara, Me, the Hybrid, or Gallifrey. It felt like lazy writing to take the easy way out and give everyone the “happy” ending where no one died, and there was really no monster to defeat. As if it needs to be said, Capaldi. His performance was great. Again. And Coleman herself was quite good too, 100% emotion when she says goodbye to him. I absolutely loved the classic control room in that TARDIS. Oh, do I love it. I would decorate a room in my house that way. The sound editing. Really, I had a hard time picking up the dialogue from the background music and other sounds. That frustration made the episode less enjoyable. Too bad they couldn’t get Timothy Dalton back as Rassilon, plus everything on Gallifrey seemed rather rushed. Rassilon was banished too easily and the Doctor seemed to become Lord President in a mater of moments? Having the General regenerate from a bald white male into a bald(ish) black female seemed a little preachy to me. Also, I liked the first actor (Ken Bones). Also also, the Doctor just murdered him. After fighting until the end of time to save someone, he cavalierly kills him, because he knows he’ll regenerate? I didn’t really like that idea. And he used a gun, this character, this legend who is famed for never carrying a weapon grabs the first gun he can find and shoots down the General in cold blood. Steven Moffat really doesn’t seem to be able to let go of Clara, or is it Jenna? Last Christmas she could have had what I’d consider a classy and touching send off if she woke up from the dream crabs an elderly woman. Instead that was a dream too and she was young and ready for more adventures. This year she had a touching and moving death that was incredibly well done, but now she’s been pulled out of time and that dignified send off has effectively been denied to the audience. I know the show is supposed to be a family show, and possibly the fault lies with me that I’ve grown up and grown impatient that the show hasn’t aged with my own viewing tastes. I think this “resurrection”, no matter how temporary it is supposed to be (since Clara did say that she will return to Gallifrey to accept her fate and return to her proper time stream and die) kind of lessens the impact of Face the Raven and my enjoyment and appreciation of that episode. Are the only TARDISes left on Gallifrey antiques hidden beneath the Matrix? Seriously? None of their temporal engineers could construct or grow more for some of them to return to the universe? That thought never crossed anyone’s mind? I wanted more resolution to Gallifrey. Bring it back once and for all, have the good Time Lords running it and just move forward, or have it sealed away still and continue to have the Doctor trying to rescue it as he kind of lost track of that goal pretty quickly in this regeneration. And again, the Gallifreyan segments of the story all seemed quite rushed. For all the importance they were putting on the Doctor not being able to recognize Clara and having to forget her to keep her safe, uhm, the Doctor now knows what Clara looks like again because she was painted on the side of the TARDIS. At least the paint disappeared when the ship dematerialized. Great now there’s a diner travelling around in space, and , I feel that having Clara and Ashildr’s TARDIS look like a diner forever is just an excuse to make “restaurant at the end of the universe” jokes. Does anyone else feel like Clara’s “death” is rather meaningless now, which is actually more sad than her actual death? Well, that was intense wasn’t it? 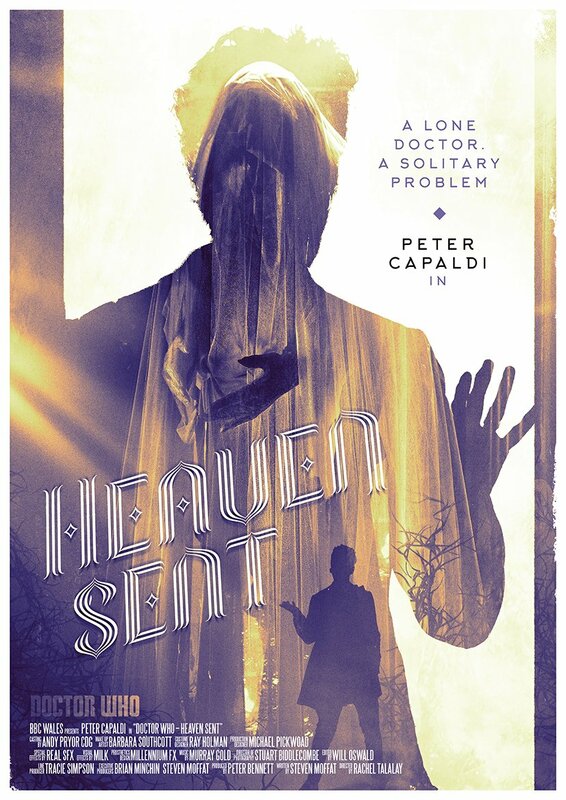 Heaven Sent was a remarkably well built up “build up” episode, leading into next week’s series finale Hell Bent. I’m even more excited for the finale than I was for this week’s episode because there are still so many questions left unanswered. At the end of the last episode (Face the Raven) the Doctor was transported to parts unknown, by party or parties unknown, immediately after witnessing Clara’s death. Alone. Saddened. Angry. Scared. The Doctor is without his best friend and being chased by a monster throughout a mysterious mechanized and moving castle. The monster is known as “The Veil” and the Doctor says he knows what it is, or that he’s seen it before (sorry, I’m very tired tonight and haven’t had a chance to re-watch the episode, so some things may be fuzzy). The Veil shambles very slowly after the Doctor, who has timed it’s pace and knows how far away to draw it so he can rest or eat or plan his next move in relative safety. The mystery deepens as the Doctor discovers the vague clues that will hopefully lead him from this prison that has been designed specifically to frighten him. It seems the only things that will stop the Veil from advancing upon him are truths. On his first face to face meeting with it, the Doctor confesses that he is scared of dying, and that stops the creature. Throughout the episode the Doctor will confess more things to stop the Veil, some personal, some just general secrets; but all the while he’s narrating away to the absent Clara. The Doctor does just that. Each room in his prison (except the final trap room) resets itself each night, so the Doctor realizes that there is a version of himself from when he first arrived stored in the hard drive of the teleport. After punching the wall a few times, the Veil kills him, but Time Lords are notoriously hard to kill. Even when regeneration fails, it still takes them days to die, so the dying Doctor crawls back to the teleport, hooks himself up and triggers the mechanism, bringing a brand new version of himself back to play the game again. A game he plays for a billion years until the wall is finally broken. At that moment a brilliant light shines through the hole in the wall, shattering the Veil and dropping it into a clockwork pile of scrap and the Doctor steps through. The rift he used collapses, and he’s cut off from the teleporter, the castle, and stuck out in a desert it appears. The rift has turned into a small disc — his confession dial, which we see close on the miniature castle. He turns to see a small boy who he tells to run to the city and find somebody important; tell them that he’s back and he knows what they did, and that he’s on his way, and if they ask who he is tell them he’s had to take the long way ’round. The camera pans out and we see the city. The Doctor is on Gallifrey. He gives us one last line before the close though, that the hybrid is not half Dalek, nothing is half Dalek, that the hybrid that is destined to conquer Gallifrey and stand in it’s ruins is him. As if it needs to be said, Capaldi. His performance was great. Again. It was effectively a one man show tonight, and he shone, showing again why he is such an excellent Doctor. A great mix of suspense, fear, and still some heart as he deals with the death of Clara. I’m sure there are things to nitpick at, like how come the Azbantium wall room doesn’t reset and rebuild the wall? But overall I couldn’t find much not to like. I’ve really enjoyed this season so far, and after seeing the trailer for the finale I certainly hope they don’t screw it up! I’m nervous about next week…..if the Doctor is “the Hybrid” will this incorporate line from the Paul McGann/Eighth Doctor movie where he revealed to the Master that he was half human on his mother’s side? It might make some sense as the trailer describes the Hybrid coming from two warrior races, and who could be more war like than we humans? I know Moffat likes to meddle and tamper with the history of the show, but that is one part I chose to forget. I actually remember reading a Doctor Who comic book where they effectively retconned that out, when the Doctor mentioned tricking someone by lying and saying he was half human. This episode was written by showrunner Steven Moffat, whose stories I really didn’t enjoy the last several years. This season though, he’s been very good. Maybe back in the form that made him probably my favourite writer of the Russel T. Davies era. Could it be that I wasn’t really a Moffat hater, but a Matt Smith/Eleventh Doctor hater? Next week we are Hell Bent, on getting some answers, resolutions, and hopefully the payoff to the long writer’s game we seem to be in. I’ve stayed off the social networking sites all day now (I have no idea what sort of food my friends have eaten or what their cats have done, I did however finish raking my leaves…. ), but I don’t think that’s really fair. I have no problems with fans posting reviews after the episodes have aired. It’s fair game then. I have problems with the spoilers coming from “official” sources like the BBC or their publications. For my part, I know that if people are going to “live tweet” a show that I should stay away, but if something is spoiled for me, that’s my own fault. Even though the show airs five or six hours earlier in it’s native England, most of the fans (or at least the ones that I know/follow) are respectful enough and cognizant of time zones and air times. My new Twitter/Blog friends The Whovian Complex are in California, which is an extra three hours behind even me, and they post their episode reviews sometimes a week later. I can just imagine how frustrated they are trying to avoid spoilers, but applaud them for not inadvertently revealing any themselves. Alright, enough preamble, what did I think of tonight’s episode, as the Doctor and Clara reunite with Rigsy (from last season’s excellent Flatline episode) and visit Diagon Alley….well, or somewhere that appears to be the Doctor Who equivalent of the Harry Potter locale. 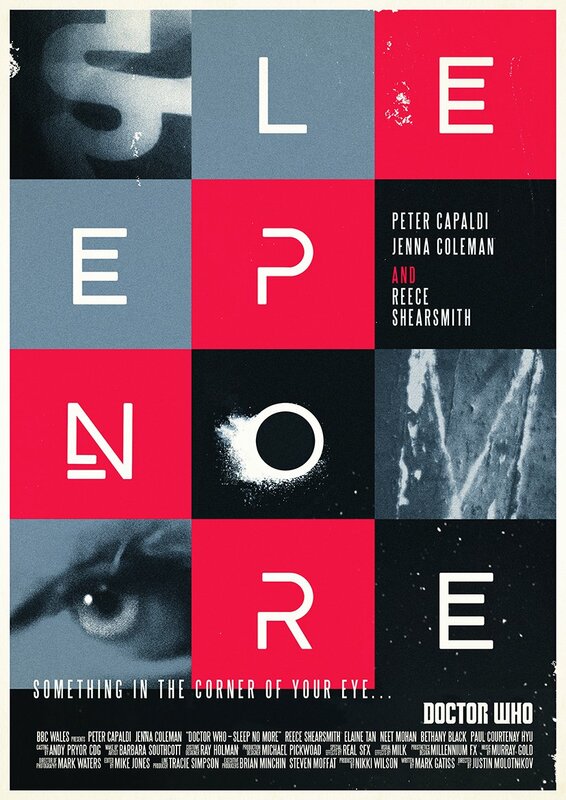 Before this episode, I watched The Whovian Complex’s recap/review of Sleep No More…maybe I should switch to video reviews instead of all this typing…. Anywho, Nate brought up an incredibly interesting point: we don’t know when the last episode took place in the grand timeline of things. It was found footage after all, so it could have happened in between the Doctor’s trips to Skaro (I did notice that he changed pants mid story in either Magician’s Apprentice or Witch’s Familiar) or it could have happened right after the Zygon stories. Anyway, his hypothesis was that Clara’s already dead and the Doctor has been making waves in time by visiting her in the past to “keep” her around. Interesting. We’re off to a great start as the Doctor and Clara rush into the TARDIS fresh from some off screen adventure, and with my mind racing on these new theories it’s even more obvious that Clara’s acting more reckless than usual, and enjoying the danger of their adventures more than she should. Rigsy calls Clara in the TARDIS to tell her that he’s got a tattoo….but not just any tattoo, it’s a tattoo on the back of his neck that he doesn’t remember getting (in fact he has no memory of the last day) and the tattoo is changing, in fact it’s counting down. Time to call the Doctor. The Doctor, Clara and “Local Knowledge” (Rigsy) discover a mysterious hidden street in London that has been masked from view. It turns out that the street is a refuge camp for aliens, there they can hide from whatever they’re fleeing, and from the indigenous human population, unlike the Zygons and others throughout the years. Sometimes humans do stumble upon the hidden street, and they’re given the retcon drug (remember that from Torchwood?) to erase their memories of what they saw there. Rigsy was one of those people, but he apparently murdered an inhabitant of the street, which has earned him his “countdown to death” tattoo. The tattoo is a quantum manifestation, and it was handed down to him by the “mayor” of the street, Ashildr (I’m not going to call the character “Me”). The Doctor is wary of Ashildr, and has been for a while especially after he saw her in the background of a photo from one of Clara’s students, apparently stalking his companion. Racing against time to clear Rigsy of murdering an alien to save him from his death sentence, the trio begin to investigate, but first, suspecting a trap, the Doctor makes Ashildr promise that no harm will come to Clara while they are there, and that she’s under her personal protection. Ashildr agrees, and Clara runs recklessly off. She learns from one of the inhabitants that Rigsy could pass on the death mark to someone else, so Clara convinces him to pass it on to her. She figures that since she’s been guaranteed safety by Ashildr that this will just allow them to buy time to solve the mystery and save Rigsy. Clara claims that she’s just doing what she and the Doctor always do and convinces herself that everything will just be okay, because it always is. Unfortunately there are more traps than you would think here in this “trap street” and in clearing Rigsy of murder (because the “victim” is actually still alive and in stasis), a trap is sprung on the Doctor by an unknown adversary. To release the seemingly dead alien from stasis the Doctor must use the TARDIS key to unlock the device which triggers another device that clamps a teleport ring onto his arm, as well as takes the TARDIS key. Was it all a plan of Ashildr to gain access to the TARDIS? No, someone else wants the Doctor separated from his ship and to be delivered to them on their own terms. 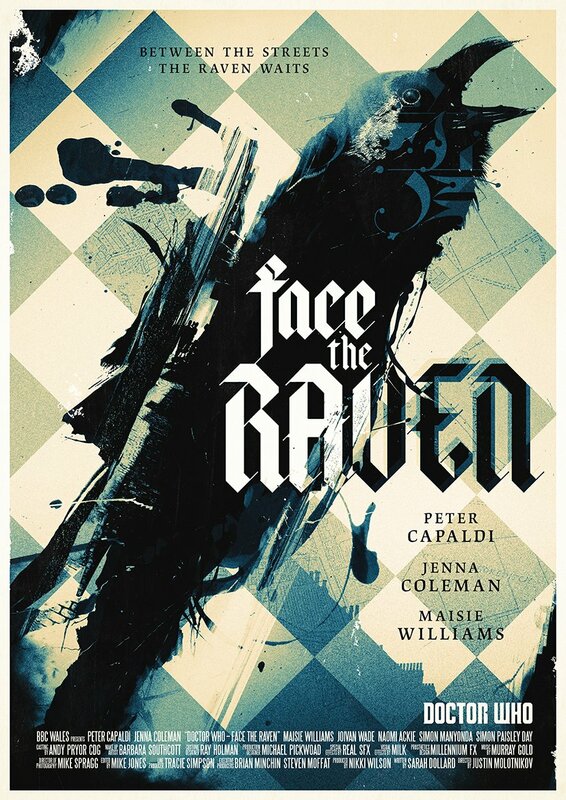 With the trap sprung, Clara reveals her deception to both Ashildr and the Doctor, but she’s miscalculated and now that she’s inserted herself into the equation, Ashildr can no longer revoke the death sentence, and so the Raven (the quantum shade that kills the lawbreakers of the street) now comes for Clara. Of course Clara and the Doctor have their chance to say their goodbyes, and Clara dies bravely, but she does die. The Doctor delivers another series of great monologues tonight which reminded me of the “fury of the Time Lord” that we were shown at the end of Human Nature/Family of Blood. He’s angry, and rightfully so, but Clara had made him promise not to get revenge, because she knows how her death and how is vengeance and anger will affect him. It was quite touching watching these two say goodbye to each other and the “countdown” plot device really made it work. The Doctor teleports off. Alone. And we cut to the credits……but wait, there was a “next time”, it was after the credits, and we see the Doctor in a stone castle like structure, digging graves, but we never see who he’s talking to. Now, my memory is fuzzy at best these days, but does this castle, and the Doctor’s outfit, not seem to match with those we saw in The Witch’s Familiar when Missy was telling Clara the story about why the Doctor never loses? Clara died. It was time for her to go. Too many of the stories focussed on her instead of the Doctor and she was just horrible and stupid. Clara died. She was my favourite character on the show, and the best companion to the Doctor EVER! I can’t imagine the show without her! Was it time for her to go? Probably. Did she need to die? I don’t think so. I would have been very happy if they had just let her wake up from the dream crabs as an old woman in last year’s Christmas special. I think that would have been the perfect sendoff to a very strong character. I like Clara; I like Jenna Coleman, she was fresh and a great actress for the role. The first thing I liked about Clara was that she wasn’t Amy Pond. Amy was a character I did not like at all, so I would have welcomed anyone who came in after her, even Adric. Did the Clara character overshadow the Doctor a lot lately? Yes, in Series 8, I think she did, and I didn’t like those stories, but I thought she was great in the second half of Series 7. Right up until the finale of that season (Name of the Doctor) where the insertion of herself into the Doctor’s timeline didn’t make any sense at all, and seemed to mark the beginning of the “overpowered” Clara that a lot of fans didn’t like. Did she die bravely? Yes. Did she need to? No. She didn’t die in a moment of self-sacrifice to save the Doctor or humanity or to stop the villain like Adric (Earthshock) or even Astrid (Voyage of the Damned), she died….I’m not really sure why she died. I can think of several ways it could have been avoided right now. Ashildr, the immortal, could have taken the quantum curse herself and not been killed. The Doctor probably could have taken it too, but that would mean regeneration. She could have entered the stasis device (that was right in front of them) and avoided the Raven of death too. Also, how did Ashildr (or whoever is pulling her strings) get a copy of the TARDIS lock to put on her stasis machine to trap the Doctor? Certainly trying to unlock it with the sonic specs would have been a better first move? But what is done is done and we can’t change it, we can only wait to see what happens next week. It will be interesting to see who replaces her as the Doctor’s travelling companion. I’m surprised that people keep thinking that Maisie Williams’ Ashildr could be the next companion. I think after tonight’s actions that’s completely ruled out, plus, sorry, but I personally didn’t find her performances that good. Ah well, we have two weeks and a Christmas special to go, before we find out anything more for Series 10. Until next week…. From the scuttlebutt I saw on Twitter tonight’s episode wasn’t very well received. Personally I didn’t think it was terrible, but it certainly wasn’t one of the good episodes. It could have been. It had a lot of potential and seemed like it was trying to hit all the right notes that had worked in past episodes. An abandoned space station, monsters roaming the corridors, soldiers, a scientist, a morally dodgy experiment. Yeah it all seems to be there, so why did people fall asleep during Sleep No More? First, this was a “found footage” style episode, and while I applaud them for trying something different with the storytelling, the reason and the way we were shown the story just didn’t work. The Doctor and Clara, are wandering around a space station that orbits Neptune. Actually before that a rescue party of soldiers board the space station trying to discover what has happened to the crew as the station had gone silent. We’re introduced to the team through the narration of Rassmussen (Reece Shearsmith), the scientist who runs the station and has developed the Morpheus device (or box or chamber or pod, I really can’t recall what it was called) that removes the need for sleep in human beings because time is money, and we waste a third of our lives sleeping. Clearly this is a bad idea, and of course something has gone wrong as large sand-like creatures are chasing the lone survivor and his would-be rescuers around the station. These “sandmen” are actually made up of the sand/dust we normally find in the corners of our eyes when we wake up in the morning, but through the Morpheus process they’ve grown? Multiplied? Somehow there are billions of them and they group together to form blind monsters that shamble down the corridors, trying to kill or feed on human beings. They’re what destroyed the original crew of the station. So now the Doctor has to find a way to stop them, and save everyone. By the time the episode resolves itself, the audience has mostly given up caring. The monsters or the “sandmen” were pretty inventive, and looked effectively scary enough. Their creation sounded a little dubious and the way they were defeated was even worse, but at least they looked like they had potential. I was told to always look for the good in things and to keep an open mind….tonight I’m struggling to find more “good” about Sleep No More…ah, the Doctor quoted Macbeth, and that’s my favourite Shakespeare play. Other than a quick little bit of banter with the Doctor at the beginning of the episode, was Clara even in this one? She really did nothing. She ran when the Doctor said run, and she reassured us (and the Doctor) that he’d save the day, but other than that, she really seemed absent from the episode. I’m not sure I understand what’s going on here. We know Jenna Coleman is leaving at the end of this year, I don’t believe it’s been announced if it is will be in the series finale or in the Christmas episode. I know that a lot of fans were upset with the “Super Clara” character that developed the last few years who overshadowed the Doctor. It seems like they’ve written her completely opposite to that this year, and now she’s almost “Invisible Clara”. There still are many fans of Clara, are the writers trying to soften the blow by showing those fans that the show will go on without her? If I were a die hard Clara fan, I’d be more upset at the way character has been underutilized in her final year than the fact that it is her final year. At least next week’s episode seems to allow the Doctor and Clara to share the stage. The rescue team had potential to be interesting characters. I liked the idea behind the Grunt 474 character (Bethany Black, the first openly transgender actress cast by the show), and I liked Commander Nagata (Elaine Tan), but they really didn’t get any development. The soldiers are running from the sandmen all episode long, guns drawn, and I don’t think any of them even tried to shoot one. I may be mistaken, but it seemed the only reason they had their guns out (all episode long) was because they had flashlights on them, and we had to see what was down each poorly lit corridor. After last week’s Zygon Inversion and “that speech” which was possibly the highest point of Capaldi’s run as the Doctor, this episode felt like it was just a filler. Was there a set of opening credits for this episode? I may have missed them but I don’t think there were any. If there were, let me know below! The “found footage” angle was popular fifteen years ago and it’s popularity died out probably ten years ago. Plus, having a grain of sand in everyone’s eye that had ever used a Morpheus device acting as a camera inside everyone’s head (and also being the reason why the creatures were blind) to give the story multiple camera angles makes the whole “found footage” effect fall flat and fail. Hacked helmet cameras would have been better. What exactly happened here? Were the sandmen defeated by gravity? Did they burn up as the space station entered Neptune’s atmosphere? What exactly does a “gravity shield” have to do with keeping the station in orbit? I don’t know if the Doctor actually defeated them. The ending was left horribly ambiguous but really, I don’t think anyone cared. Last week’s episode ended with a Zygon copy of Clara firing a rocket at the Doctor’s plane as it passes over London and with a Zygon police officer about to kill Kate Stewart in New Mexico. This week the real Clara starts to wake up inside her Zygon pod to see a world that is not quite right. She’s trapped in her apartment, with windows and doors that lead nowhere, with gobbledygook in the newspapers, black toothpaste in the medicine cabinet, reversed numbers on the alarm clock, and a television set that allows her to see through the eyes of the Zygon commander who has taken her form. But that television set works in both directions, as the Zygon reads Clara’s memories; memories such as the Osgood Box…. Well, based on every clip and behind the scenes photo the BBC put out this past week we know that everyone survived. I don’t know about you, but I now try to stay away from everything that could be a spoiler. It wasn’t that long ago that we had to actually watch a show to find out what happened, and we really had to “tune in next week” to find out what was going to happen next week. Now we get the behind the scenes interviews before the show airs about how Character A really liked how they treated their character before they were killed off at the end of the show, or how they weren’t really dead because they climbed into a dumpster and hid from the monsters. The biggest source of potential spoilers used to be the TV Guide, now they’re everywhere! It’s funny that I rant about this now, but last week’s episode didn’t feature a “next week” trailer clip (presumably to avoid spoilers), and that I really enjoyed next week’s trailer clip for Sleep No More. Yes, everyone survives from last week as Clara causes the Zygon to misfire her first rocket which warns the Doctor to the attack and gives himself and Osgood enough time to parachute to safety as the plane is hit by a second rocket. Kate survives because she’s a trained soldier, and simply shoots her Zygon attacker. We finally learn what the rogue Zygons plan to do; they’re revealing themselves as aliens so that humanity will fear them and go to war. A war they plan to win so they can take over the planet and live the way they want to. As the Zygons make their way to the Black Archive to get the Osgood Box which will instantly transform every Zygon on Earth back to their normal appearance, the Doctor, Osgood and Kate head there as well. Once the key players are together it is revealed that there are two Osgood boxes, just as there were two Osgoods, one human, one Zygon. One box for the humans, one box for the Zygons and each with two identical buttons inside marked TRUTH and CONSEQUENCES. In the human box, one button will detonate the nuclear warheads under London destroying humans and the invaders and alike, the other will release the deadly Z-67 gas and literally turn every Zygon on Earth inside out, obviously killing them. In the Zygon box, one button will revert all Zygons on Earth to their natural form for an hour, the other will remove the ability to shape change from every Zygon on Earth forever, making them human. Of course, which button does what? The real purpose behind the Osgood boxes is now revealed by the Doctor: the boxes are there to make each side stop, sit down and talk out their problem. But who will go first? Who will blink? Who will forgive? The Doctor gives a beautiful speech about himself, what he had to live with during and after the Time War, and about peace. He says that the only way anyone can live in peace is if they are willing to forgive. Peace is eventually restored, but at what cost and to which side? Better than last week, as things did actually happen, but this probably could have been a one part episode. The moral message was great, and the Doctor himself was effective in delivering it. The real Clara didn’t really do much of anything this week, did she? “Evil” Clara ate up every scene she was in (including the ones she acted opposite herself), but the original was really just there for the memories…. You know what one of my biggest problems with Kill the Moon was? It completely ignored science and physics and logic. Peter Harness did the same thing again tonight as he somehow had Kate Stewart arriving in London mere hours after leaving Truth or Consequences, New Mexico. That’s a distance of 8247 km, which even if she travelled the speed of sound (mach 1 or 1234.8 km/hr) it would have taken her more than 6.5 hours to arrive. Let’s say 7 hours for the travel time to the airport and cleanup of the dead Zygon. Also, how is it broad daylight in both places? For a show that deals a lot with time travel, you’d think they’d remember the terrestrial time zones we already deal with on a daily basis. And oh, my facts and figures on the distance between London and New Mexico came from Google, same with the speed of sound calculations. Perhaps Mr. Harness might like to check into using it too one day. The puns are okay, but the “Dr Disco” bit is getting a bit silly. Just like the hoodie and t-shirt under his Crombie coat, and the sonic specs I’m not really on board with “Disco”… Keep the puns, keep the character light, but don’t get ridiculous with it. After seeing them in three episodes now, I’m not really a fan of the updated look of the Zygons… I wasn’t a huge fan of them originally either though. With flashbacks aplenty Peter Harness explains to us the history of the Zygon peace treaty that emerged from The Day of the Doctor, and sheds some light on Osgood’s death from Death In Heaven last season. Last season as well Peter Harness gave us Kill the Moon. You’ll excuse me if I’m not overly confident that this two part Zygon tale is in safe hands. The peace treaty that was negotiated (off screen) before the climax of the 50th anniversary special allowed for twenty million Zygons to integrate themselves into Earth’s population, and to remain anonymous to all but UNIT. All seemed well, until a splinter group developed inside the Zygon high command that wants to reveal themselves, be themselves and of course take over the Earth. One woman was key in keeping the peace between humanity and the Zygons, and that was Osgood, who was killed by the Master at the end of last season. But which Osgood was killed? Was it the human or her “sister” the Zygon? They kept the secret to keep the peace. Never letting anyone on either side know who was who. Now, Osgood has been taken prisoner by the rogue faction, but before her capture, she managed to get a message to the Doctor. Reuniting with Kate Stewart and UNIT, the Doctor calls upon Clara to help him solve the mystery and prevent all out war. This all sounds good, but really I didn’t think that anything happened in this episode. Well, let me clarify, sure things happened, UNIT sprung into action, and traps were sprung around them. Key humans were replaced by Zygon duplicates, and we’re not quite sure who we can trust. It very much reminded me of the 11th Doctor episode with the ‘Gangers (Rebel Flesh) in that way. Everyone splits up in this episode, Clara stays in England to help UNIT; Kate Stewart goes to New Mexico to track down Osgood; and the Doctor goes to a small European village that UNIT has discovered to be a Zygon training facility and are intent on bombing. By the end of the episode, everyone has walked into a trap, and the Doctor’s plane is about to be shot down by a rocket launched by Zygon infiltrator. As I said, it didn’t really feel like anything happened in this episode. We were left with more questions than answers, unfortunately the questions were just parts of the story, and not something the audience thought up on their own. This episode moved along really slowly I thought. A lot more story could have been developed and delivered if they picked it up a notch or two. Depending on how next week turns out, I really wonder why this one was a two parter. 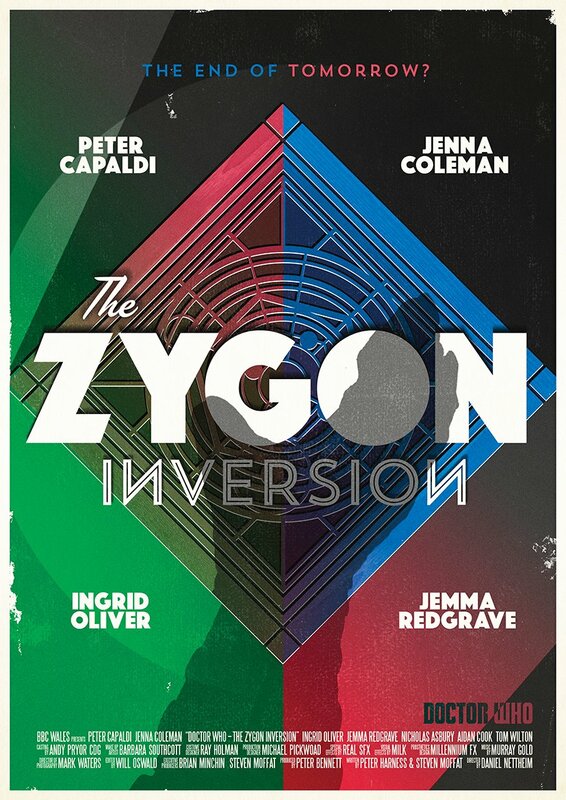 Zygon Invasion played up a lot of classic sci-fi themes and current political issues such as racism, war and refugees, but failed to really make them matter and instead pushed slowly into the disjointed invasion plot. I think they made a reference to Harry Sullivan, travelling companion to the Fourth Doctor, who was a Naval doctor and did encounter the Zygons in their only other episode. We got more references to the “hybrid” that it seems will be the big, deadly, climactic season finale, over-reaching plot point. I’m not minding this one as much as in past years, because we’re just being reminded that it’s on the Doctor’s mind, and not being hit over the head with it every week, like the Nethersphere clips last year that took up valuable screen time that (a few times) could have been better used to flesh out the stories. Everyone splits up? With rogue Zygon factions, the “head” of UNIT goes to America alone? Really? This just felt like it fell out of an old Scooby-Doo script. The logic. Again. How do 20 million new people just show up an integrate themselves on Earth? The surviving Osgood will probably die next week and we probably still won’t know if she’s human or Zygon. They better not hatch another one of her, fully grown out of thin air….or the moon. They really seemed to be playing up “Clara’s Theme” in this one….we get it. She’s done at the end of this series. Why did every reveal have to be so obvious? 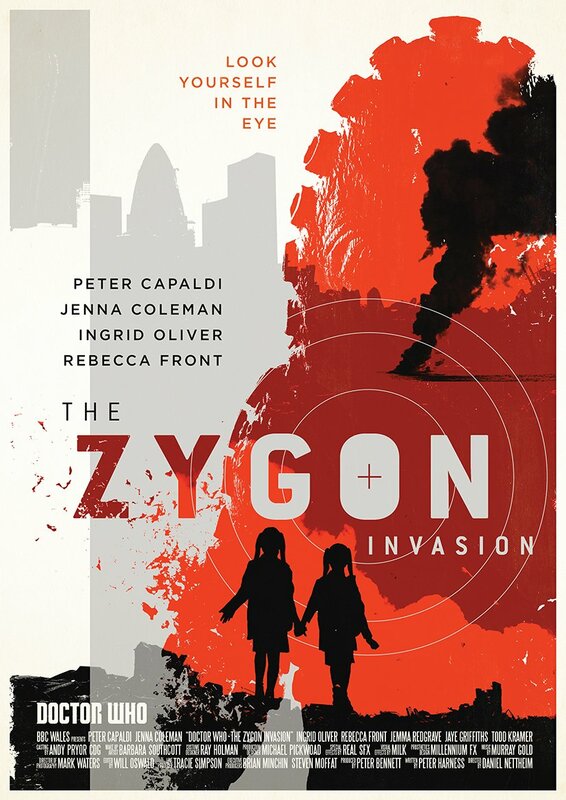 I’m dreading the point where they make a “let Zygons be Zygons” pun next week. The Zygons were not really well played tonight. They could have been a tragic monster, one we have sympathy for, but they were reduced to snarling killing machines. There was no “Next Time” this week, probably because it would answer some of the questions this episode asked itself be too spoiler-y, so here’s a clip they put out to celebrate some of the scarier moments of the show since tonight was Hallowe’en. We are now halfway through Series Nine and so far it has been a very enjoyable season of Doctor Who. Sure there have been minor quibbles, (such as sonic glasses), but after several very disappointing seasons, this season was refreshing in that there really wasn’t that much to complain about. All good things do come to an end though, and while The Woman Who Lived wasn’t a bad episode, it just wasn’t as good as it could have been, or as good as the past ones. There is a highwayman known as “The Nightmare” robbing the inhabitants of 17th century England and he has his eye set on a jewelled amulet. The Doctor also is visiting 17th century England, tracking an extraterrestrial object that crashed to earth, which just happens to be the same jewelled amulet. Interrupting The Nightmare as he is robbing a coach for the prize, the Doctor learns that The Nightmare is in fact the immortal Ashildr. But what does she want with the jewel? The Doctor assists her (or she assists him) in retrieving the gem, as he tries to learn what has happened in her life since he last saw her several hundred years earlier in the viking village. Reading her diaries, he sees that Ashildr’s immortality has not been all roses. Great periods of her extended life were filled with sadness. She has loved and outlived her loves. She has lost children and friends which has caused her to become a bitter and unfeeling person, never using the other “immortality chip” that the Doctor left with her because she has not found anyone worthy of it. But now she has an accomplice who is also interested in the alien gem; Leandro the last of the Leonians who will use the gem to open a portal that will allow them to travel the stars. Of course this plan doesn’t sit well with the Doctor. 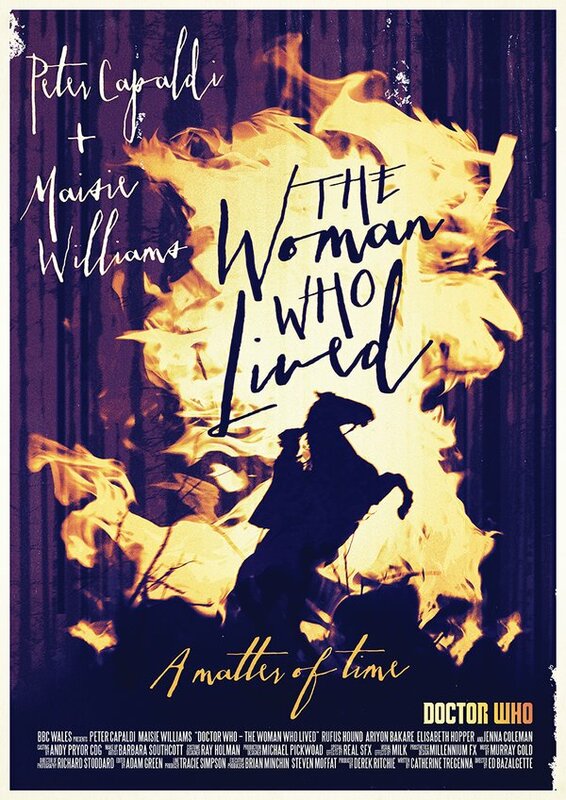 With The Woman Who Lived, we get to see what happens when the Doctor leaves. Last week he saved someone’s life, accidentally made her immortal, and then left her for eight hundred years. Sure it was hinted that the Doctor checked in on her from time to time, but he did nothing to prepare her for her life or for the world ahead. There was the potential to like a lot about this episode but it just sort of felt disconnected to me for some reason. 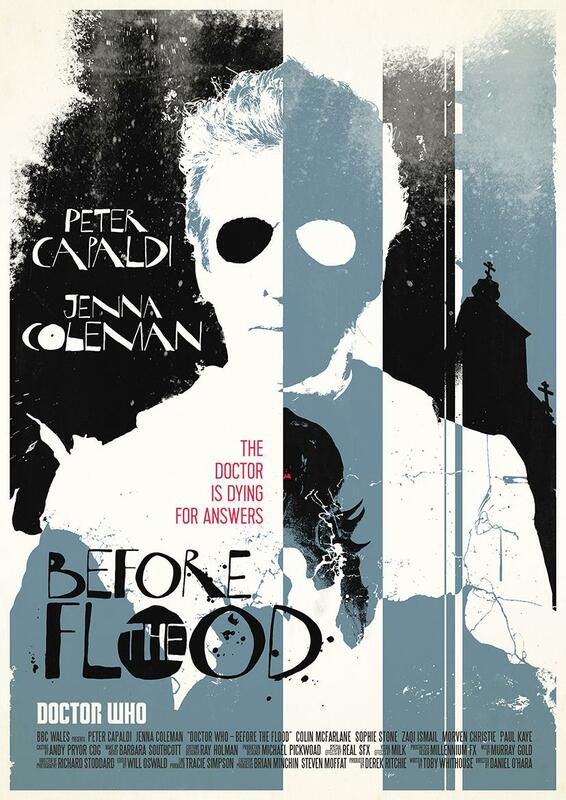 The insights into the characters were very well done, and a tale of the tidal waves created after the Doctor appears was an interesting idea, it just felt like the hook of the story didn’t hook me. The dialogue was what really carried this episode, and perhaps that took away from the “science-fiction” aspect of it, which just felt tossed in, where past episodes this season did such a good job of mixing the two seamlessly. Sam Swift the Quick, the comedic and clever highwayman who rivals The Nightmare. Rufus Hound was quite brilliant as Swift, and the banter was fun. The hanging scene was played for laughs, but also there are accurate historical roots here. These highwaymen were the celebrities of their day, and people would turn out to watch their hangings. Leandro looked great, even though he looked a lot like Ron Perlman in the old Beauty and the Beast tv show. A very good companion-less episode. I like these sometimes since they remind us how good the Doctor can be. One of my biggest gripes about the last few seasons of the Moffat era is how ineffective they’ve made the Doctor, who seems to need the companion (Amy or Clara) to fix and solve everything. Written by Catherine Tregenna who wrote several good Torchwood episodes, so the decision to lean more on the moral implications of immortality and such make some sense. A “lion man” alien named Leandro, the last of the Leonians. Really? That’s the name we came up with? Pretty lame. Also, I told you the Doctor would walk into something wearing those sonic glasses in the dark…. It was incredibly obvious what the resolution to the problem of the rift caused by a death was going to be. We still have no resolution to having immortal characters running around in the world. I didn’t really find Maisie Williams that good in this episode. Lines at “Yes, it is me, what took you so long old man” (which was edited in the trailers) really didn’t come across very well. It sounded hokey. Also she seemed a bit too much like a child playing dress-up to be believed as a highwayman (or highwaywoman). There was much hoopla in the months leading up to Doctor Who’s ninth series when Maisie Williams was announced as one of the guest stars. Williams is best known for her role as Arya Stark in the HBO’s Game of Thrones. From the hype and excitement, I’ll assume she’s pretty good. I’ve never watched Game of Thrones, and I’ve given up about halfway through the third book on reading it for about a year now. I will say that Arya was a great character, one that I enjoyed, but the writing style of the book frustrated me to no end, so I had to put it down again. Eventually I’ll get back to it I suppose, but there have just been so many other things and books that have taken priority. While half the buzz about Williams’ appearance in the show is because of her acting ability (as I said I assume she’s a good actress given that she won a Saturn Award for Best Performance by a Younger Actor in a Television Series), but the bigger buzz seem to come from the conjecture generated about the character Williams will play based on the teaser trailers and clips released before the season began. From a few simple lines, which are probably taken out of context, it is assumed that somehow she is related to the Doctor’s past. He says “you!” when he sees her, and she says something like “what took you so long old man?”. I’m hoping she really isn’t tied to the Doctor’s past, because every attempt they’ve made recently to “adjust” the history of the show has turned out poorly. Remember those multi coloured Daleks? Hopefully this clip just means Williams ran up a flight of stairs faster than the Doctor and he arrives at the top out of breath. While I love Capaldi this year, I’m sorry, his “chase scenes” do look a little awkwardly comical. He looks to run about as well as I do. This episode was written by Jamie Mathieson, who wrote what I considered to be two of the best episodes from last season (Mummy on the Orient Express and Flatline), and this one felt much more Mummy than Flatline. The prelude of this episode with Clara drifting in space and the TARDIS under attack resolved really quickly and seems to have just been the means to get the Doctor to land on Earth in the middle of a viking camp. The Doctor and Clara are quickly taken prisoner and separated from the TARDIS as they are brought to the viking village. Along the way, as the Doctor tries to show off his superiority, the viking warriors break his sonic sunglasses. And a huge portion of fandom rejoiced. Their journey to the village takes them two days. Two days when Clara assumes the Doctor is coming up with an escape plan; and he does….sort of. Presented to the villagers the Doctor proclaims himself to be a human manifestation of Odin, and demands that he and Clara be released. The vikings of course don’t believe him because a visage of Odin appears in the sky above them with an offer to bring their most strongest and bravest warriors to dine in Valhalla with him. Suddenly several armoured (almost robotic looking) warriors materialize to scan the villagers and take the strongest and most intelligent. Of course Clara is taken too, along with Ashildr (Maisie Williams), a young viking girl who the Doctor seemed to recognize earlier. The vikings are not taken to Valhalla, but to a spaceship, where they are killed and “Odin” drinks their testosterone to strengthen himself and his warriors. They are actually an alien race known as the Mire, who Ashildr inadvertently challenges to a battle, which does happen to save her and Clara’s lives. Returned to the village, Clara and Ashildr inform the Doctor that they have 24 hours to train the farmers who were left in the village into warriors to defeat a vastly superior foe. Again we are given great insight and development into the character of the twelfth Doctor. Character development taking priority over gimicky plot decisions and condescending dialogue. That’s why I’ve enjoyed this season so far. The Doctor seems worried, and almost fearful. He doesn’t see any way that he can train these men to fight the Mire and win. He has no sonic and no TARDIS, and a somewhat comical crew of viking farmers. The Doctor’s best advice for them is to run. Hide. Get out of there, and avoid the fight. And it makes sense. How many times has the Doctor changed people and turned them into weapons or warriors? How has it ended for them? The Doctor is worried what would happen if he did manage to win. If the villagers defeat the Mire word would spread, the Earth would become strategically important, it would become a target. If he saves one village, he causes ripples that would turn into tidal waves as someone would come and wipe out all life on the planet, all because he saved this one village. Of course the Doctor does come up with a plan and he does save the village, but at what cost? 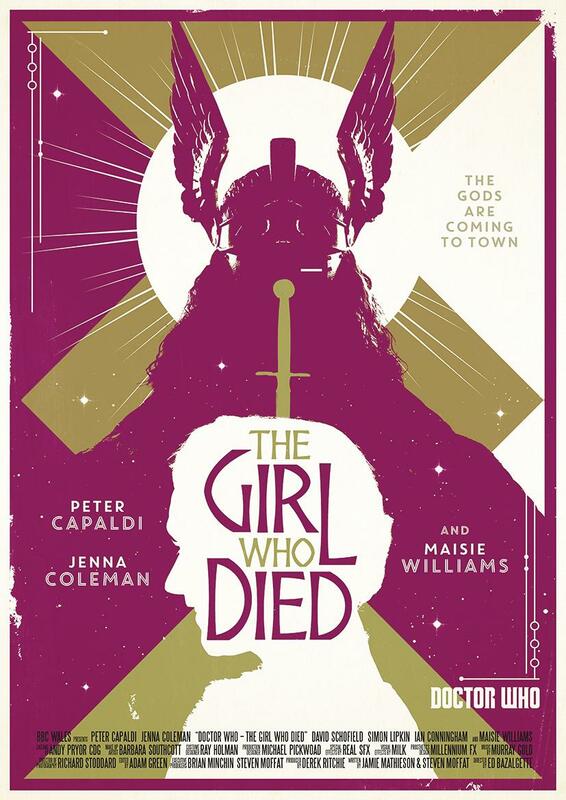 Remember, the title of the episode is The Girl Who Died… Through some superior trickery and the help of the villagers and especially from Ashildr, the Mire are shamed into retreat, and blackmailed into not returning and not telling anyone what happened, but it costs Ashildr her life. At this point the Doctor has a revelation. Catching his reflection in a barrel of water, he knows who he is, and he knows why he has the face that he does. He remembers back to his own past, back to the Fires of Pompeii, where (at Donna’s pleading) he saved Lucius Caecillus Ivcundus and his family from the deadly eruption of Vesuvius. He chose this face to remind himself that he saves people, no matter what. No matter how impossible or “wrong” it might seem at the time, he’s the Doctor and he saves people, so he comes up with a way to revive Ashildr using reprogrammed nano technology from one of the Mire’s field medical kits, but in doing so, he fears he may have made her effectively immortal, and with that little bit of alien technology inside her, it also makes her a hybrid. The kit will keep “repairing” her forever, which will lead us into next week’s episode: The Woman Who Lived. This was another solid episode, and I liked how, though it is technically a two parter, it was really self contained. In fact, it may not even be a two parter, rather it just continues with characters from the previous episode, kind of like how Adam joined the Doctor and Rose at the end of Dalek and carried on into The Long Game way back in Season 1. The story was both light and dark. There were humourous moments with a viking who fainted at the sight of blood, and there was the slaughter of the village’s warriors. It was easy flowing, but also touching and full of heart. The Doctor translating the cries of a baby was an incredibly well acted and well written scene. It is interesting to note that next week’s “follow up” episode was not written by Jamie Mathieson, but by Catherine Tregenna who had previously written episodes for Torchwood, including the very good Out of Time episode, where a plane from the 1950s appeared through the rift into the present day. Very solid character development, and very touching insights into the Doctor again. Lots of references back to the show’s history. Not only clips of Fires of Pompeii and Deep Breath, but quite a few quotes from previous Doctors. Tonight Capaldi’s Doctor “reversed the polarity of the neutron flow” and lamented that “time will tell, it always does” quoting his third and seventh incarnations. I also really liked the earlier line he had that said “premonition is just remembering in the wrong direction”. The Mire were quite an effective “monster” and I really liked the look of them, both with and without their helmets on. The Doctor once again thinks his way out of the problem. The end of the sonic sunglasses! The sonic sunglasses are back, as they’re seen in the trailer for next week. I really liked the costume for Capaldi’s Doctor. The simple white button down shirt, the black boots and the coat were classic and in my mind could be iconic. Mixing it up with t-shirts and hoodies really doesn’t do it for me when we were given such a good look in the “unveiling”. And the checkered pants from tonight were kind of silly looking. Clara really didn’t do a whole lot this week. She muddled into trouble (twice if you count the opening), gave the Doctor a bit of a pep talk, and got a hug, but for the second week in a row, really didn’t do a whole lot. I know she hasn’t been the most liked companion by the fandom these past few years, but they can’t just ignore her. Perhaps these episodes were written before Jenna Coleman had agreed to return for another season, and they’re just shoe-horning her in? I think the theme for this season is “paradox” because this is two stories (E1&2, E3&4) that have revolved around them. As we watch though we see how the Doctor has orchestrated this future, since he knew he was going to die he had nothing to lose. It is now 1980, and a remote Scottish village has been dressed up as a mock Russian town for training purposes as we are at the height of the Cold War. The spaceship is sitting in the middle of the square and we learn that it is a “hearse”, piloted by Prentis, a Tivolian who are the most conquered race in the galaxy (“If you occupied us, you’d be home by now.”). The Tivolians were conquered by the Arcateenians, who deposed the Fisher King who apparently died and was being brought to a remote, unimportant place (our planet, not just the village) to lie for eternity. Somehow though he wasn’t dead and awoke from the ship to kill Prentis who became his first ghost who, along with the mysterious writing on the wall, initiated the Fisher King’s plan to use the electromagnetic energy of his victim’s “souls” to set up a beacon so his people could come and find him, and enslave the population of the Earth. Back in the TARDIS, the Doctor calls Clara to learn that there is a fourth ghost, and it is his. Now he must come up with a plan to stop himself from dying, even though that would mean breaking the laws of time. As the ghosts in the future trap and torment Clara, Cass and Lunn, the Doctor confronts the Fisher King in the past where he tricks the alien warlord into thinking he will circumvent the laws of time to save himself and his friends and prevent the future he’s already seen, simply by erasing the writing scrawled on the walls of the spaceship. The writing puts a kind of psychic plant in the minds of all who see it, “tuning” them to the Fisher King’s frequency almost, and then using them to kill others to strengthen the signal they will send to the King’s people for his rescue. Racing back to the ship to see the writing is actually still there, the dam explodes and floods the city, but does it kill the Fisher King? In the future, the suspended animation chamber is opening to release it’s occupant…..
Of course that occupant is the Doctor who reveals that he wasn’t ever killed and wasn’t really a ghost, it was just a pre-programmed hologram he came up with that he used to then capture the remaining ghosts in the Faraday cage, and then save the day, but how did he get that idea? His ghost was saying the names of the crew members and the Fisher King’s victims, and he knew the order the names the “ghost” was saying because Clara told him. And she only could tell him because it was already saying them….and we’ve looped back around to the opening of the show and the Bootstrap Paradox. I enjoyed this episode again, but maybe not as much as the first part. It was cleverly written and actually explained itself up front when it basically came out and told the audience how the episode was going to solve itself with a paradox. It was clever, but it didn’t feel like it was a “taunting” clever like some of the paradox type episodes in past seasons did. This one didn’t feel like it was just there to preach to us about how smart, clever and tricky the writer could be. It still had some thrills, and some chills, and it may have seemed like Clara didn’t really do much this episode, but she really did. She gave the Doctor the inspiration to fight on, to risk breaking the laws of time to save her, and she actually helped fulfill the Bootstrap Paradox. Very cool to stop the background sound and the music when we’re seeing things from Cass’ point of view. Sophie Stone did make history by becoming the first deaf actress to appear on an episode of Doctor Who last week. It may have been a bit cheese and really really obvious to have the Doctor wake up in the suspended animation chamber, but I still smiled. Nice nod to The Idiot’s Lantern in the cold open. The amplifier the Doctor plugs his electric guitar into has a plaque reading Magpie Electronics. Clara calls out to a deaf woman so she can find her…well at least she realized she was being an idiot then. All the characters that I think would make great companions seem to die off….sorry O’Donnell. The Fisher King itself. It looked like a cross between a lobster and a vampire from one of the Blade movies. For all the thrills and tension built up by the ghosts, this slow walking “monster” really was a let down. It didn’t really do much or show why it was such a dangerous creature.